Sachiko Kono, the current President of Tomodachi Daiko, Inc. born in Tokyo has been studying, teaching and sharing the fun of taiko since 2000. The founding member of Tomodachi Daiko, Sachiko thought taiko a fun way to introduce her Japanese language immersion students to an ancient Japanese art form. Sachiko received instruction from Master Tanaka of The San Francisco Taiko Dojo and helped her to build the first taiko “made in Alaska.” In addition, she has been trained by Chokoma in Japan. She also attended workshop by Kodo, Dengakuza, and Hachiko Taiko. From humble beginning using drums made of tires, Tomodachi Daiko has grown under her guidance. Sachiko’s son is among the top performer of Tomodachi Daiko. 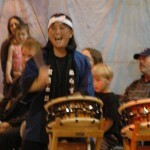 Sachiko most enjoys playing with Tomodachi Daiko and seeing the smiles.